He had a tough time tuning ('Close enough for jazz,' Brooker told him at one point), but he finally got it right, and what do you know – they sounded great together. He plucked out the opening to Power Failure, and then the band came in, altering the rhythm slightly to fit Kottke's folk strum, and it was simply gorgeous; the twelve-string filled out their already stately sound magnificently. They seemed to be enjoying themselves, and I can't help hoping that something concrete comes out of this; perhaps they should back him on his next record, or he could guest on one of theirs. 'Philosophical references and musings occur frequently in conversations with Kottke, who usually underpins his more serious remarks with a sense of self-deprecating irony or cynicism intended to dispel any notions of grandeur or genius one may attribute to the 47-year-old guitarist. RICHARD: This must be your 15th time through Britain, I mean's you're a regular visitor here. LEO: I certainly am. The first time I inflicted myself on your shores here was with Procol Harum who really are responsible for my ever having jobs available over here. RICHARD: How did that happen? RICHARD: So this is really getting back to the sort of music that Procol Harum picked up on back at the start. LEO: That's right, that's right. 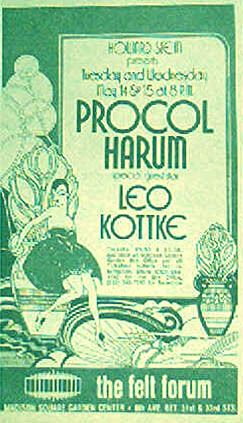 'Procol Harum had heard the Takoma record in England, where it was handled by Sonnet. They showed up at a gig I did at Paul's Mall in Boston and said, 'Do you want to do a tour?' I said, 'Sure,' and off I went to Europe. They gave me Europe. The biggest I've ever been is in Germany, and it's only because of them, really. I did two European tours with Procol Harum and had an absolute ball with those guys. They became very good friends of mind. I learned a lot from them. Here is an excerpt from Machine Gun Kottke: Into the Myth Gap by Tom Murtha from Rolling Stone, August 29, 1974, with a piece about a Procol Harum concert in May 1974. Last summer (1973) in Germany, Leo proved to himself that he was still Leo. 'I was completely shocked at the tunes that got the best response,' he said. In May, with 3500 people present at the Felt Forum with Procol Harum, Leo seemed again to be playing to those 30 hearties at Minneapolis's Scholar, even though proprietor Mike Justin was not on hand to frump at the high school kids to shaddup and listen to the music or get out. Here is Leo Kottke's Liner Notes from Live In Europe (1980) where he writes: 'I'd like to thank Procol Harum who made it possible for me to work in Europe'. 'Kottke even once managed to land a pop hit, making Billboard's Top 30 with his cover of 'Pamela Brown.' He also enjoyed a brief brush with the rock world, touring Europe in the early '70s with Procol Harum.